I want to like Tsukemen Ramen. I want to appreciate it. But, I just don’t and it makes me feel like I am not getting something essential about living in Tokyo. My taste buds have betrayed me as I kind of think Tsukemen tsucks. 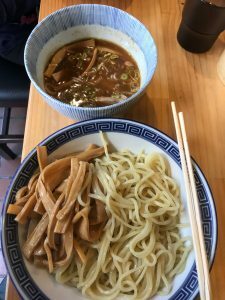 Tsukemen Ramen is essentially deconstructed ramen. Each component of the classic ramen bowl is served separately: Noodles, broth, toppings. The noodles are served chilled or room temperature. You dip them into the broth, which is a thicker, more concentrated, more powerful liquid than what you get in soup. Add a slice of pork, a bamboo shoot, egg, whatever and slurp it all up. Tsukemen was invented in 1961 by Kazuo Yamagishi at his ramen shop Higashi-Ikubukuro Taishouken. The dish was called “Mori-Soba” and it was started as a staff meal that gradually made it onto the menu. As the dish is served at a cooler temperature that regular ramen, it became a popular summer dish and gradually became a staple of ramen shops throughout Tokyo and the rest of Japan. I tried Tsukemen for the first time in Los Angeles. I appreciated the concept, but ultimately found the dish unsatisfying. In Tokyo Tsukemen is everywhere. All my favorite shops serve a version and I would say that 50% of the customers order it. I hated my first Tokyo Tsukemen. I found the dipping broth far too amped up with dried anchovies — an umami overload that erased the subtleties of the noodle. I thought I should persevere, so I kept ordering it — I felt like a wannabe junkie who keeps shooting heroin in hopes of finally understanding all the hype. I had a few versions that tasted good, but the love eluded me. Finally, the other day, I went with my son to our favorite Ramen shop: Kami-Itabashi’s Tamashii Soba. I decided to try the Tsukemen because I believed if I would finally have an epiphany, it would be there; I love Tamashii’s noodles, the master makes them every day and they are toothsome, springy and hold the broth perfectly — serve them solo, as in Tsukemen, and you would have, I thought, an easy winner. I tried my best. I dipped my beloved noodles into the dipping sauce which was as wonderfully balanced as the master’s regular soup — rich chicken broth, a hint of pork bone all rounded out with the flavors of anchovy, garlic, dried mushroom and ginger. I recognized the goodness of it, recognized the pleasure of such a dish, but I found myself gazing at my son’s regular bowl with jealousy. When I want ramen, I want the fully tactile pleasure of blazing hot soup, noodles slurped loudly to both inhale broth and protect the mouth from scalding. I want my nose to run. Tsukemen just doesn’t engage me the same way. I realize it is exactly the same as a dish of pasta. I would not get the same pleasure from dipping even the best pasta into a concentrated version of Carbonara. I want my pasta, as I want my ramen, to absorb some of that sauce, that broth — to be unified in perfect harmony rather than broken apart into separate pleasures. I bow my head in shame to the Ramen gods. I am not yet a true Tokyoer.